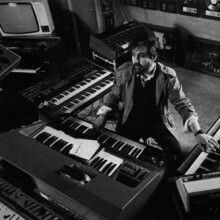 Vangelis (Evangelos Odysseas Papathanassiou, Greek: Βαγγλης Παπαθανασου) is a world-renowned electronic composer and musician. He was born on March 29, 1943 in Volos, Greece. He is best known for compositions such as the Academy Award-winning 1981 theme to the movie Chariots Of Fire, the entire score to the movie Blade Runner and the themes used in the soundtrack of Carl Sagan's Cosmos. His first musical effort was in the late 60s in his country of birth, a locally popular band called Formynx. Vangelis (Evangelos Odysseas Papathanassiou, Greek: Βαγγλης Παπαθανασου) is a world-renowned electronic composer and musician. He was born on March 29, 1943 in Volos, Greece. He is best known for compositions such as the Academy Award-winning 1981 theme to the movie Chariots Of Fire, the entire score to the movie Blade Runner and the themes used in the soundtrack of Carl Sagan's Cosmos. His first musical effort was in the late 60s in his country of birth, a locally popular band called Formynx. He then moved to paris and formed the more internationally-known band Aphrodite's Child with Demis Roussos and Lucas Sideras. They had several hits, being the first one "Rain And Tears". After the group disbanded, Vangelis went on to write several film scores. There were rumours that he would join the band Yes, and he became close friends with their singer, Jon Anderson. In the mid-70s his output really grew, with several solo albums, including "Heaven and Hell", "Albedo 0.39", "Spiral" and the highly experimental "Beaubourg". He then finally got to work with Jon Anderson, recording under the name Jon & Vangelis, releasing the albums "Short Stories", "The Friends of Mr. Cairo" and "Private Collection". Then in 1982 came his best-known work - the soundtracks for the films "Chariots of Fire" and "Blade Runner". Several solo albums and soundtracks have followed since then, including the scores for "1492 Conquest of Paradise" and "Alexander". The main title of "Conquest of Paradise" was used as entry music by German Boxer Henry Maske and subsequently became a No. 1 Hit single in Germany. In 1992 France bestowed upon him the Chevalier Order of Arts and Letters. In 2001 his album "Mythodea" was chosen as the Music for the NASA Mission: "Mars Odyssey". There is a minor planet called Vangelis, named in his honor. Darling readers if you are reading this, you are on on the page of the recording artist vangelis in our eLyricsWorld. Our database comprises with data about 52389 artists worldwide as well as 829824 songs 194 of which are from vangelis. Besides the singer's biography, on this page you can see brief information about them, enlists birthdate, genre, label Be conversant with all the facts around vangelis by adding RSS feed. If you prefer you could directly visit the address you are on at the moment and check out what's new and latest songs about the artist.